Stifled by life in middle-class India, Krishnan is desperate to see more of the world. He takes a year out from his studies to visit the exotic island of Great Britain. 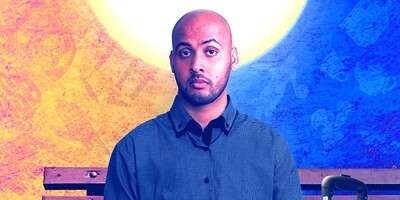 Pariah Khan is a writer and performer, voted as one of Bristol’s 24 Most Influential Young People by Rife Magazine for his work in theatre and comedy. He was also chosen by BBC Three as one of the UK’s top 50 creative young people to pilot their Playground scheme with The Latimer Group. Outside film and theatre, he works as a villainous professional wrestling manager. His debut one man show ‘An Indian Abroad’ takes the trope of white adventurers exploring ‘foreign’ lands and spins this concept on its head, asking that all important question: what if someone from India took a gap year to Britain?